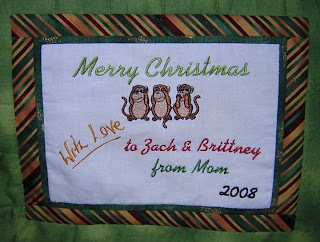 Just in case you are wondering, I make a quilt block with my embroidered design. Then I place the block face down on the fusible side of the lightest non-woven interfacing I can buy. I stitch all the way around the block with a short stitch length and trim the seam allowance with pinking shears. I slit the middle of the interfacing so I can pull the block through to turn it right side out. I carefully pull the block through the slit and push out the edges and corners. Then I press the block, interfacing side down, on a Teflon pressing sheet or a piece of paper from paper-backed fusible web. Make sure you remember to use the pressing sheet or the shiny side up on the paper backing. You don't want your quilt label stuck to the ironing board (or your iron)!! Next, I place my block on the back of my quilt. I use Warm and Natural or Soft and Bright batting by the Warm Company. Even though Soft and Bright is polyester batting, I can press my label on the back of my quilt to baste it in place without damaging the polyester fibers. Then I hand stitch the label in place in three places, each ditch of the seam and the edge. I start on the inside seam and work my way out. The label is secure and looks so cool! 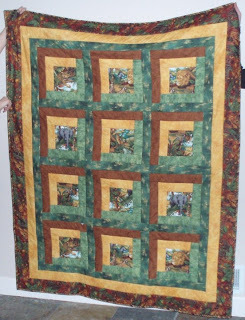 Now to get two more quilts done for the other two kids and their spouses. 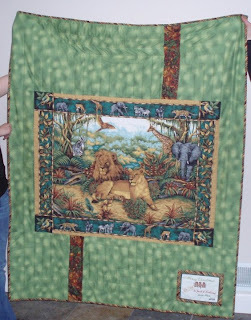 But first to get two tops quilted for the first grandchild to arrive in June.